The KADS-1 is an active speaker with multi-channel, digital audio and power provided over a single cable. It is designed to be used in conjunction with the KADS-100 controller that can daisy-chain up to ninety-nine speakers. 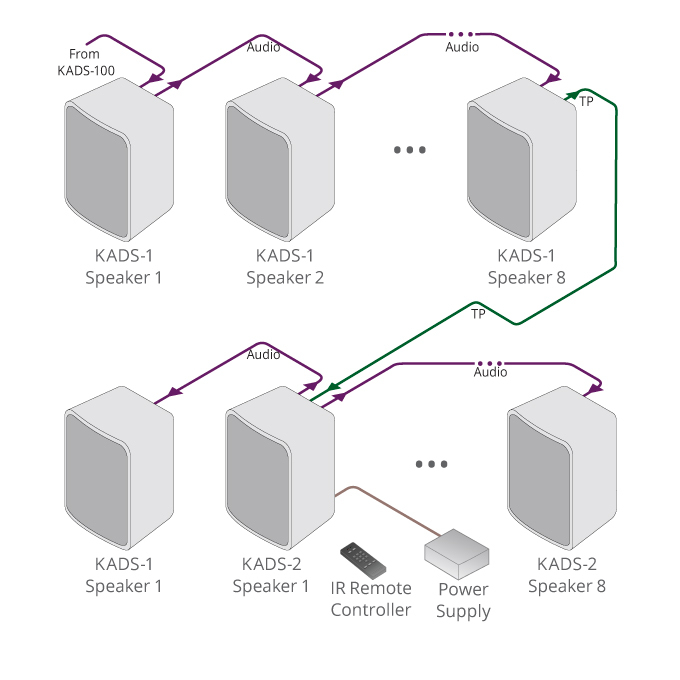 The KADS-1 has a single output that can be connected to either another KADS-1 or a KADS-2 up to 30m away with a total of eight speakers in the chain. Highly Flexible Layout Options - Up to 99 speakers (8 per branch). Additional branches/speakers require an optional power supply for each 8 speakers. Control - Via the KADS-100 controller. Speaker ID - Set unique ID on each speaker for control from KAD-100 Controller. Built-in 25 Watt Power Amplifier. - Power via KADS-100 controller for 8 speakers. USB - For firmware upgrades. Range - 30m (100') between speakers with a 240m (800') total system range without additional power supplies.